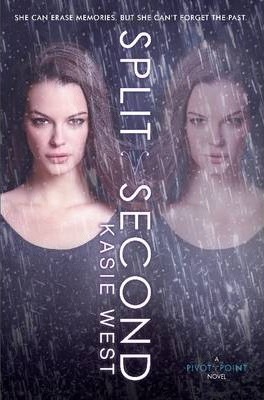 Kasie West delivers nail-biting suspense and heart-pounding romance in the thrilling sequel to Pivot Point. Addie has always been able to see the future when faced with a choice, but that doesn't make her present any easier. Her boyfriend used her. Her best friend betrayed her. So when Addie's dad invites her to spend her winter break with him in the Norm world, she jumps at the chance. There she meets the handsome and achingly familiar Trevor. He's a virtual stranger to her, so why does her heart do a funny flip every time she sees him? But after witnessing secrets that were supposed to stay hidden, Trevor quickly seems more suspicious of Addie than interested in her. She wants to change that. Laila, her best friend, has a secret of her own: she can restore Addie's memories ...once she learns how. But there are powerful people who don't want this to happen. Desperate, Laila tries to manipulate Connor, a brooding bad boy from school-but he seems to be the only boy in the Compound immune to her charms. And the only one who can help her. Addie hardly recognizes her life since her parents divorced. Her boyfriend used her. Her best friend betrayed her. She can't believe this is the future she chose. When Addie's dad invites her to spend her winter break with him, she jumps at the chance to escape into the Norm world of Dallas, Texas. There she meets the handsome and achingly familiar Trevor. He's a virtual stranger to her, so why does her heart do a funny flip every time she sees him? But after witnessing secrets that were supposed to stay hidden, Trevor quickly seems more suspicious of Addie than interested in her. And she has an inexplicable desire to change that. Meanwhile, her best friend, Laila, has a secret of her own: she can restore Addie's memories . . . once she learns how. But there are powerful people who don't want to see this happen. Desperate, Laila tries to manipulate Connor, a brooding bad boy from school--but he seems to be the only boy in the Compound immune to her charms. And the only one who can help her. Kasie West lives with her family in central California, where the heat tries to kill her with its 115-degree stretches. She graduated from Fresno State University with a BA degree that has nothing to do with writing.